In Japanese trains, liquid crystal displays (LCD) are often found above doors. 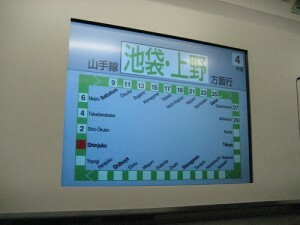 On the displays, they show the time tables, station information, advertisements, forecast and so on. The displays are not only convenient but also entertainment to kill some time in the train. 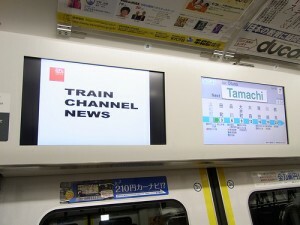 For example, the JR Yamanote Line in Tokyo has two displays above a door and provides Train Channel on them. One on the left, they show their original programs includes forecast, news, fortune telling, gourmet information, manner lecture, English lecture, trivia, quiz and also commercials between. 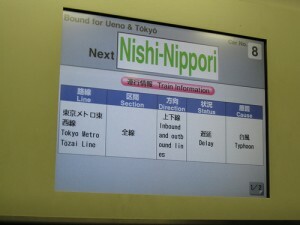 And on the right, they show the information about the train includes the time table. The time table is detailed, and you can see how many minutes to take to get your destination. Also shows transfer information, which side of doors open. Although being in crowded train for long time is unpleasant, those displays successfully entertain the passengers with fun contents.